Clear Invisible Braces MD - Do clear braces get stained? If you have recently started an orthodontic regimen, you may be wondering why your clear aligner trays or invisible braces have stains or spots. Discoloration can occur due to improper cleaning. Patients near Gambrills, MD have turned to Dr. Bingham-Lester for Invisalign. With proper care, you can get properly aligned teeth without the concerns of bad breath or discoloration. Invisalign is a popular brand of removable aligner trays. This treatment addresses mild to moderate orthodontic concerns. From start to finish, Dr. Bingham-Lester makes sure you know what to expect with your aligner tray treatment including educating patients on the proper usage and care of the trays. 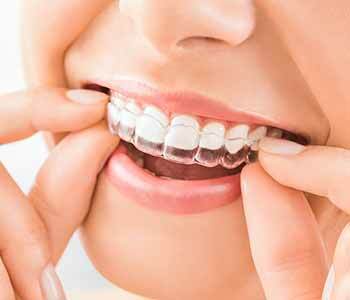 Orthodontic treatments involve the placement of additional materials in the mouth. This gives bacteria more to cling to and increases the ability to multiply. The added bacteria can cause bad breath or discoloration of your aligner trays. Preventing the buildup of bacteria and plaque is the best treatment option. Following good oral health habits prevents unwanted problems. Brush your teeth before putting the trays in your mouth. Do not use toothpaste to clean your trays. Soak your trays according to your dentist’s instructions. Maintaining proper oral hygiene is important for everyone but especially for orthodontics patients. Aligner trays can be removed for eating, drinking, and brushing. Regular brushing and flossing removes unwanted bacteria. Your trays cannot stay clean if you put them on dirty teeth. Brushing your teeth before replacing your trays minimizes bacteria. While cleansing your mouth, it is important to clean your trays daily as well. This keeps the trays clear of bacteria, stains, and food particles. If plaque builds up on your trays, odors and spots will appear. You can clean your trays with a toothbrush. Use cool water to cleanse and rinse. Remember, never use toothpaste on your aligner trays as the abrasiveness can scratch, damage, and discolor the trays.